Infection of mice with Listeria monocytogenes caused marked lymphocyte apoptosis in the white pulp of the spleen on day 2 postinfection. We prove in this study that listeriolysin O (LLO), a pore-forming molecule and a major virulence factor of Listeria, could directly induce murine lymphocyte apoptosis both in vivo and in vitro at nanomolar and subnanomolar doses. Induction of apoptosis by LLO was rapid, with caspase activation seen as early as 30 min post-treatment. T cells lost their mitochondrial membrane potential and exposed phosphatidylserine within 8 h of treatment. Incubation of lymphocytes with a pan-caspase inhibitor blocked DNA laddering and caspase-3 activation, but did not block phosphatidylserine exposure or loss of mitochondrial membrane potential. We describe a novel function for LLO: induction of lymphocyte apoptosis with rapid kinetics, effected by both caspase-dependent and -independent pathways. Infection of mice with the Gram-positive intracellular bacterium Listeria monocytogenes is a well-established model for studying host-pathogen interactions (1, 2). We and others have observed dramatic hepatic, splenic, and hippocampal apoptosis in infected mice after challenge with Listeria (3, 4, 5). The hepatic lesion was seen 24 h postinfection and consisted of Listeria-infected hepatocytes that had pyknotic nuclei and were TUNEL positive. The lesion was worsened by depletion of neutrophils or blockade of systemic TNF-α or IFN-γ with neutralizing antibodies. In addition, infection of cultured hepatocytes with Listeria led to apoptosis (4). Lymphocyte apoptosis induced by Listeria infection peaked at 48 h postinfection in the spleen of i.v.- or i.p.-infected mice (3). The lesion was restricted to the periarteriolar lymphoid sheath after infection with doses at or below the LD50. However, at higher doses, the lesions extended throughout the entire white pulp. The level of lymphocyte death could be extensive. 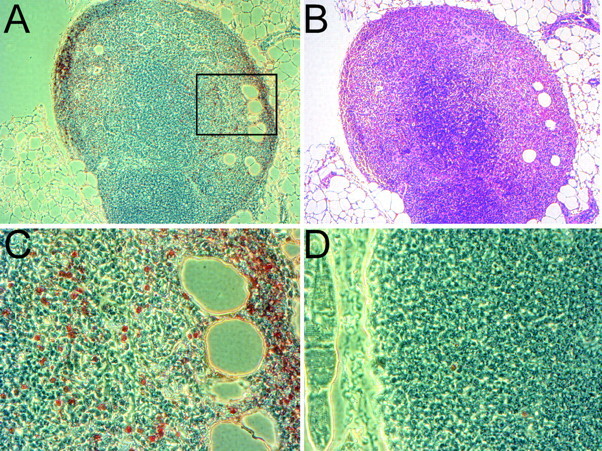 Infection of mice with Listeria through the footpad led to apoptosis in the deep cortical region of the popliteal lymph node. Unlike the hepatic lesion, apoptotic lymphocytes were not infected with Listeria, although extracellular bacteria were seen near dying cells by electron microscopy. This led us suspect that soluble host and/or bacterial factors were effecting lymphocyte death. Based on that hypothesis, our laboratory tested many strains of genetically modified mice and neutralizing Abs against a wide variety of cytokines, but such treatments mostly led to exacerbation of the lesion. The only treatments that blocked either the lymphocytic or hepatic lesions were infection with listeriolysin O (LLO)3-deficient Listeria, neutralization of LLO with anti-LLO antibody, infection of mice previously challenged Listeria, and injection of heat-killed Listeria (6, 7). Intracerebral infection of mice with Listeria also induced an apoptotic hippocampal lesion related to the level of bacterial invasiveness (5). The broad spectrum phospholipase of Listeria, plcB, was the critical determinant of cerebral virulence. However, plcB-deficient as well as internalin A- and internalin B-deficient bacteria still induced hippocampal apoptosis. The authors of the study suggested that a possible mechanism for cerebral apoptosis was that release of LLO combined with hydrogen peroxide produced by Listeria to induce apoptosis (5). This conclusion was supported by the finding that removal of pneumolysin O or hydrogen peroxide from Streptococcus pneumoniae prevented neuronal apoptosis in a rabbit model of infection (8). LLO, a member of the cholesterol-dependent cytolysin family of pore-forming proteins, is a major virulence factor of Listeria. The molecule has homologues to other cytolysins from many Gram-positive bacteria (9). The major role of LLO is to allow escape of Listeria from the phagosome to the cytosol of infected cells (10, 11). LLO is probably the molecule responsible for the in vivo apoptotic lesions. It could be released extracellularly during the early exponential growth of Listeria in infective foci and contact the surrounding lymphocytes, leading to their death (3). LLO-induced lymphocyte lesions, which are massive, could play an early modulatory role in the infection. Evidence for LLO as a lymphocyte apoptogenic molecule in vivo comes from our recent experiments in which injection of mAbs to LLO reduced the lymphocyte apoptotic lesions (7). However, as the number of Listeria in the mice was also reduced, it becomes difficult to conclude whether LLO or other Listeria components were responsible. Direct proof that LLO can initiate apoptotic death is still lacking. The most compelling argument in favor of LLO as a directly apoptogenic molecule is that it induced DNA fragmentation of dendritic cells in vitro (12). Other hemolysins have been associated with apoptotic events. Pneumolysin combined with hydrogen peroxide triggered apoptosis of human microglia by inducing the release of apoptosis-inducing factor from mitochondria (8). Two members of the repeats in toxin family of pore-forming molecules, α hemolysin and leukotoxin, were also implicated in apoptosis. The α hemolysin of Escherichia coli induced DNA fragmentation in human lymphocytes at low doses, but it was unclear whether the mechanism of death was apoptotic (13). The leukotoxin expressed by Actinobacillus actinomycetemcomitans induced apoptosis in the promyelocytic cell line HL-60 (14) and in a line derived from EBV-transformed B cells (15). Leukotoxin from Pasteurella hemolytica caused zeiosis and chromatin margination in bovine lymphocytes in vitro (16). In this report we investigated whether purified LLO could be inducing apoptosis of T cells, separate from any role as a lytic cellular molecule. Purified recombinant LLO induced apoptosis of in vitro cultured T cells and lymph node lymphocytes at doses that were not lytic. LLO caused caspase activation and DNA fragmentation, which was caspase-dependent, as well as phosphatidylserine (PS) exposure and loss of mitochondrial membrane potential, which were both caspase-independent. The most impressive result was the kinetics of induction of apoptosis by LLO. We detected caspase-3 and caspase-9 activation as early as 30 min and PS exposure and loss of mitochondrial membrane potential as early as 1 h after treatment of lymphocytes with LLO, with maximal effects seen by 4–8 h.
A T cell line reactive against hen egg-white lysosyme (HEL) was developed from the lymph nodes of C.B-17 mice following immunization with 10 nmol of HEL (Sigma-Aldrich, St. Louis, MO) using conventional procedures. The T cell line was maintained in DMEM supplemented with 10% FCS and 50 U/ml IL-2 and stimulated every 14 days by combining them with irradiated syngeneic splenocytes in DMEM supplemented with 10% FCS, 50 U/ml IL-2 and 10 μM HEL. Cells were treated with LLO at different times after antigenic stimulation and assayed for apoptosis. Plasmid vectors containing His-tagged LLO were provided by Dr. D. Portnoy (University of California, Berkeley, CA). LLO was purified as described previously (17) using NTA-Sepharose (Qiagen, Valencia, CA) and was dialyzed extensively against storage buffer (50 mM phosphate/acetate (pH 6.0), 1 M NaCl, 1 mM EDTA, and 5 mM DTT). Purity was confirmed by SDS-PAGE. Before all apoptosis assays, T cells were purified. Cells were removed from culture medium by centrifuging at 600 × g for 5 min, resuspended in DMEM, underlayed with an equal volume Histopaque 1119 (Sigma-Aldrich), and centrifuged at 1000 × g for 20 min. Purified cells (1 × 106 cells/ml) and LLO were combined in 1.0 ml of DMEM, 1% FCS, and 50 U/ml IL-2 and incubated at 37°C in 5% CO2. Z-benzyloxy carbonyl-valyl-alanyl-aspartyl-fluoromethylketone (Z-VAD-FMK; Calbiochem, San Diego, CA) was dissolved in DMSO to a concentration of 50 mM and was used at 50–100 μM. DNA for gel electrophoresis was isolated from 1 million lymphocytes by lysis in 10 mM Tris (pH 8.0), 5 mM EDTA, 0.2% SDS, 0.2 M NaCl, 0.2 mg/ml proteinase K, and 0.5 ng/ml RNase A at 55°C for 8 h, followed by phenol/chloroform extraction and ethanol precipitation. DNA was quantitated by UV spectrophotometry, then 10 μg of total DNA was resolved on a 1.5% agarose gel run in Tris-acetate-EDTA buffer at 6 V/cm. Immunoblots were performed using anti-caspase-3 (8G10) and anti-caspase-9 (no. 9504) Abs obtained from Cell Signaling Technologies (Beverley, MA) according to the manufacturer’s protocol. Equivalence of protein transfer to polyvinylidene difluoride membranes was confirmed by Ponceau S staining or anti-actin immunoblot (Sigma-Aldrich). Anti-active caspase-3 (clone C92-605; 625 ng/ml), annexin V-PE, and 7-amino actinomycin D (7-AAD) were used according to the manufacturer’s instructions (BD PharMingen, San Diego, CA). The cationic dye JC-1 (Molecular Probes, Eugene, OR) was used at a 10 μg/ml final concentration in cells incubated at 37°C for 30 min to incorporate the dye. All intracellular staining was conducted with the Cytofix/Cytoperm kit according to the manufacturer’s instructions (BD PharMingen). Goat anti-rabbit IgG-FITC was used at 1 μg/ml (Sigma-Aldrich). All FACS analysis was performed on a FACSCalibur, and data were analyzed using CellQuest software (BD PharMingen). Recombinant LLO was dialyzed twice against pyrogen-free saline overnight. Up to 50 μl of LLO (40 nmol) was injected in the footpads of C.B-17 mice bred in specific pathogen-free conditions at Washington University School of Medicine (St. Louis, MO). Control mice received 50-μl injections of the same pyrogen-free saline against which the LLO was dialyzed. Inguinal and popliteal lymph nodes were removed 24 h after treatment with LLO and were fixed in 10% formalin for 24 h. Tissue was dehydrated, and paraffin-embedded sections were stained with H&E or by TUNEL as described previously (3, 4). Treatment of purified splenic lymphocytes with LLO induced their apoptosis, but it gave a high background of cellular death due to spontaneously dying lymphocytes, largely B cells, which inevitably occurs during the initiation of culture. Based on those results, we generated in culture a T cell line that provided a controlled supply of cells. The T cells entered cell cycle by day 2 after stimulation, as evident by the incorporation of tritiated thymidine. Stimulation was performed with the Ag, the protein lysozyme, and irradiated APCs, with peak proliferation on day 4 post-Ag stimulation (subsequently referred to as day 4 T cells). Results with several cell lines generated to HEL and to OVA (in H-2d, H-2k, and H-2b) in all three mouse strains gave identical results. Further, T cells purified from spleens of mice and stimulated with Con A gave the same results; resting T cells were insensitive to LLO treatment, whereas Con A-treated cells apoptosed with magnitude and kinetics equal to those of all cell lines we generated (unpublished observations). Fig. 1⇓A shows a representative experiment of [3H]thymidine incorporation on day 4 (•), day 8 (▪), or day 12 (▴) cells. Note that the incorporation of thymidine, expressed as counts per minute, decreased over time, with day 4 T cells incorporating 3–4 logs more thymidine than day 12 T cells. Phenotype of HEL-reactive bulk T cell lines. A, Day 4 (•), day 8 (▪), or day 12 (▴) poststimulation. Bulk T cell proliferation was determined by incorporation of 3H as described in Materials and Methods. B, Time course of cell death after treatment with LLO. Day 4 T cells were treated with 250 ng/ml LLO and counted in a hemocytometer after staining for trypan blue. Day 4 (C) or day 12 (D) poststimulation bulk T cells were stained with an mAb against CD4 (gray) or unstained (black). Purified day 4 poststimulation T cells were left untreated (E, G, and I) or were treated (F, H, and J) with 250 ng/ml LLO for 12 h and assayed for active caspase-3 (E and F), annexin V/7-AAD (G and H), or JC-1 by flow cytometry (I and J). All panels are representative of at least two independent experiments performed in duplicate or triplicate. We stained day 4 (Fig. 1⇑C), day 8 (our unpublished observations), or day 12 (Fig. 1⇑D) T cells with anti-CD4 to determine the purity of our cell preparations before our assays. Regardless of the proliferation state of the cells, we could purify them to >95% purity. There was no significant change in the levels of intracellular Bcl-2 or cell surface CD62L or CD69 among the three sets of cells (our unpublished observations). We determined the dose of LLO that was lytic to the T cell line to be ∼2.5 μg/ml or 44 nM. Addition of LLO at this level led to immediate lysis of the cells. The dose of LLO was then titrated to sublytic doses (2.5–250 ng/ml) to determine whether such a dose would induce apoptosis. Fig. 1⇑B shows a time course of cellular number of day 4 T cells treated with 250 ng/ml LLO. Although untreated cells increased in number during the first 24 h, those treated with LLO did not and, in fact, progressively decreased. Indeed, by 6–12 h after treatment with LLO there was about a 70% reduction in the number of live cells. This was not due to immediate lysis of the cells, because at 1 h after treatment with LLO only ∼13% of the T cells were trypan blue positive vs 3% for untreated cells. Next, we assessed cellular death caused by LLO to determine whether it was compatible with apoptotic death. Therefore, after treatment with LLO, we assayed T cells by anti-active caspase-3 staining (Fig. 1⇑, E and F, and Fig. 2⇓), annexin V/7-AAD staining (Fig. 1⇑, G and H, and Fig. 4⇓), changes in JC-1 dye clustering (Fig. 1⇑, I and J), DNA laddering (Fig. 5⇓A), and immunoblotting for caspases (Fig. 5⇓B). Fig. 1⇑, E–J, shows representative results of the day 4 T cells treated with 250 ng/ml LLO for 12 h for the immunocytometry-based assays. All assays provided evidence of apoptosis. Cells irradiated at 3000 rad were used as a positive control for most of our assays. Caspase-3 activation in T cell lines treated with LLO. T cells were treated with LLO for either 12 h (A, C, and D) or 24 h (B, D, and F) and then stained for intracellular active caspase-3. The percentage of total cells positive is graphed. The results shown are the mean ± SEM measurement of at least two independent experiments performed in triplicate, and p values were based on the Mann-Whitney U test. The data obtained with the anti-active caspase-3 and annexin V/7-AAD staining are summarized in Figs. 2⇑ and 4⇓ and Table I⇓. The percentages given in each plot or in the table were calculated from ungated populations of T cells using the same acquisition and analysis parameters for each assay. The anti-active caspase-3 assay was an intracellular Ab stain specific for the cleaved and not the pro form of caspase-3. We considered any cells under the marker boundary in Fig. 1⇑F to be positive for activated caspase-3 and, thus, apoptotic. Approximately 10% of the untreated T cells obtained on day 4, 8, or 12 poststimulation showed activation of caspase-3. In contrast, treatment with LLO induced activation of caspase-3. After treatment with 250 ng/ml LLO, ∼60% of the day 4 cells had high levels of active caspase-3 (Fig. 1⇑E and Table I⇑). The effect of LLO on day 8 cells was much less (22% affected), and it was limited on day 12 cells (12% affected). Figs. 2⇑ and 3⇓ indicate that a substantial number of day 4 cells (∼60%) showed activated caspase-3 as early as 1 h after addition of LLO. The maximum level of apoptosis was triggered by the 250 ng/ml dose, but significant activation was found at doses as low as 25 ng/ml (Fig. 2⇑A). Fig. 3⇓, B and C, also show the other parameters that will be discussed next, annexin V/7-AAD and JC-1 staining. Caspase-3 activation was completely inhibited by the pan-caspase inhibitor Z-VAD-FMK (Fig. 2⇑). Kinetics of induction of apoptosis in LLO treated T cells. 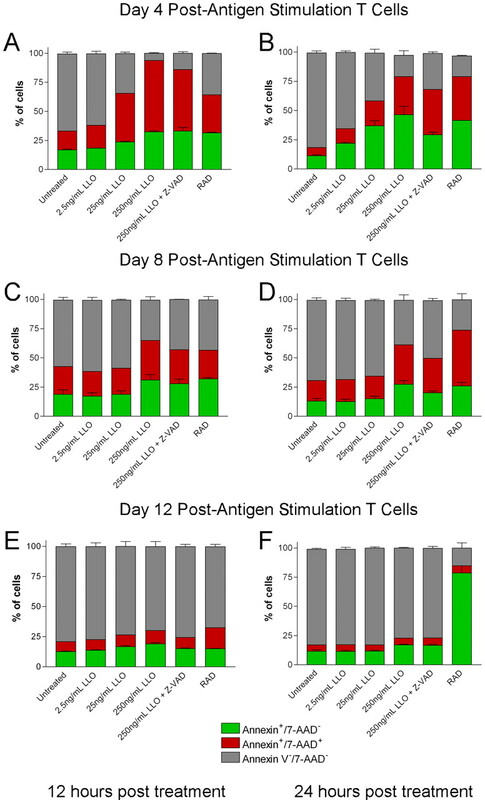 Day 4 poststimulation T cells were treated with 250 ng/ml LLO and stained for activated caspase-3 (A) or annexin V/7-AAD (B) or with JC-1 (C) at the indicated times. Bars represent the mean ± SEM of triplicate values from two independent experiments. ▨, Cells were stained with annexin V/7-AAD stain (B), and the results of day 8 T cells treated with 250 ng/ml LLO for the same times as day 4 T cells are shown. The number of active caspase-3-positive cells in day 8 (Fig. 2⇑, C and D) T cells treated with 250 ng/ml LLO was considerably less than that in day 4 cells (Fig. 2⇑, A and B). For example, the mean number of apoptotic lymphocytes assayed at 12 h post-treatment with LLO was reduced from 60% in day 4 T cells to 23% in day 8 T cells (Table I⇑). The number of day 12 cells with activated caspase-3 was low, as best noted in the 24-h assays (8% for the controls vs 12% for the LLO-treated cells; Table I⇑). Cellular division not only influenced the total number of cells affected by LLO, but also the dose required to detect a significant level of activated caspase-3. Approximately 30% of day 4 T cells treated with 25 ng/ml LLO for 12 h had high levels of active caspase-3, whereas day 8 and day 12 T cells showed levels not significantly different from background (Fig. 2⇑ and Table I⇑). We expanded on our results obtained by flow cytometry by performing immunoblots against different caspases. Included in Fig. 4⇓B are the immunoblots for detection of caspase-3 and caspase-9 of whole protein extracts taken from day 4 T cells treated with 250 ng/ml LLO. The mAbs detected both the large pro and the shorter active forms of the caspases, as indicated in the figure. Within 30 min of treatment with LLO, T cells displayed active caspase-3 and caspase-9. We did not detect significant activation of either caspase-3 or -9 before 30 min after treatment with LLO (unpublished observations). 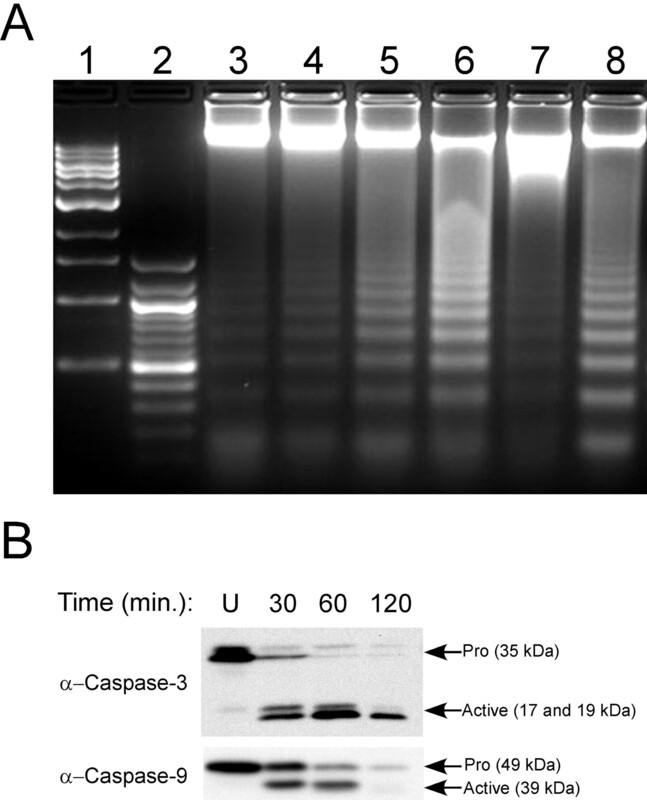 Both the pro and active forms of caspase-9 were degraded by 2 h after treatment with LLO. Day 8 T cells also activated caspase-3 and -9 as early as 30 min, but the magnitude was decreased (our unpublished observations). There was no significant level of activated caspase-8 within the first 2 h of treatment of day 4 cells with 250 ng/ml LLO despite an abundance of pro-caspase-8. We could not detect any caspase-12 in our T cell lines (unpublished observations). PS exposure on T cell lines treated with LLO. T cells were treated with LLO for either 12 h (A, C, and E) or 24 h (B, D, and F) and then stained for annexin V and 7-AAD. The annexin+/7-AAD− (green bar; apoptotic), annexin+/7-AAD+ (red bar; necrotic or late apoptotic), and annexin V−/7-AAD− (gray bar; unaffected cells) are shown. The results shown are the mean ± SEM measurement of at least two independent experiments performed in triplicate. We concluded from these results, first, that LLO induced rapid activation of at least one initiator caspase (caspase-9) and one effector caspase (caspase-3), and, second, that the process of activation was extremely rapid, taking place within the first hour. Third, the activation of the effector caspase was dependent on an upstream caspase, because it was blocked by the pan-caspase inhibitor Z-VAD-FMK. Finally, the number of cells with high levels of active caspase-3 was dependent on the activation state of the cells, with actively dividing cells being considerably more sensitive to the proapoptotic effects of LLO. One of the cellular hallmarks of apoptosis is the translocation of PS to the surface of cells. Annexin V binds to PS on the surface of apoptotic cells and was used to determine the number of cells undergoing apoptosis. The nuclear dye 7-AAD was included with annexin V staining to ensure intact cellular integrity of the cells. Therefore, cells that were positive for annexin V and negative for 7-AAD were considered apoptotic (Fig. 1⇑, G and H, lower right quadrant), whereas cells positive for both were considered dead due to late apoptosis or necrosis (Fig. 1⇑, G and H, upper right quadrant). For example, untreated day 4 cells were 17% annexin V+/7-AAD− and 16% annexin V+/7-AAD+. These numbers increased after exposure to 250 ng/ml LLO to 32% annexin V+/7-AAD− and 62% annexin V+/7-AAD+. In parallel with the results for caspase-3 activation presented in Fig. 2⇑, Fig. 4⇑ presents the same doses and time points, but for annexin V/7-AAD staining. The absolute number of cells with exposed PS after treatment with LLO was also influenced by the time of stimulation in culture. There was a marked reduction of annexin V+/7-AAD− cells in LLO-treated T cells if they had been stimulated with Ag for 8 or 12 days (Fig. 4⇑, C and D, and E and F, green bars). For day 8 T cells treated with 250 ng/ml LLO, then assayed at 12 h, 31% were annexin V+/7-AAD−, and 34% were annexin V+/7-AAD+; for day 12 T cells, 19% were annexin V+/7-AAD−, and 11% were annexin V+/7-AAD+. Thus, whereas 95% of the day 4 T cells were apoptotic or late apoptotic 12 h after treatment with 250 ng/ml LLO, 65% of day 8 cells and 30% of day 12 cells were similarly affected (Table I⇑). The decrease in the number of apoptotic cells between day 4 and day 8 T cells after treatment with LLO was not due to changes in the kinetics of induction of apoptosis, because day 8 T cells reached maximal activation of caspase-3 and PS exposure at the same times as day 4 cells (our unpublished observations and Fig. 3⇑B, compare ▪ (day 4 T cells) with ▨ (day 8 T cells)). The total number of cells killed by LLO was dependent not only on the proliferation state of the cells, but also on the dosage that would induce cell death. Doses as low as 25 ng/ml could induce PS exposure on cells only if they were rapidly dividing. Greater than 70% of the day 4 T cells treated with 25 ng/ml LLO were either apoptotic or late apoptotic, as determined by annexin V/7-AAD staining (Fig. 4⇑A, column 3, and Table I⇑), whereas the levels of PS exposure on day 8 and day 12 cells treated with 25 ng/ml LLO were not significantly different from the levels in untreated cells (Fig. 4⇑, C and D, column 3, and Table I⇑). We concluded from these results that cellular activity influences the dosage sensitivity and magnitude of PS exposure in response to LLO treatment. JC-1 is a lipophilic dye that preferentially embeds in the plasma membrane of the mitochondria. Upon induction of an apoptotic pathway that disrupts the mitochondria, JC-1 turns from red to green, indicating clustering of the dye and fluorescence quenching due to loss of the intermembrane potential, ψm (Fig. 1⇑J, upper and lower right quadrants). Fig. 1⇑I shows untreated day 4 T cells; ∼80% of the cells were in the upper quadrants, and only 6% of the cells were in the lower right quadrant. After treatment with LLO for 12 h, only 37% of the cells were in the upper quadrants, whereas 51% of the cells were in the lower right quadrant (Fig. 1⇑J). Day 4 T cells treated with LLO began to lose ψm within 1 h, reaching close to maximal levels by 4 h post-treatment, with >50% of the day 4 T cells JC-1 green by 12 h after treatment with 250 ng/ml LLO (Figs. 1⇑J and 3⇑C). The loss of ψm was not blocked by treatment with Z-VAD-FMK (our unpublished observations). Therefore, the early mitochondrial involvement in LLO-induced apoptosis was rapid and caspase-independent. Fig. 5⇓A shows the result of a DNA fragmentation gel electrophoresis of day 4 T cells treated with LLO. The presence of DNA fragmentation was evident after treatment with 25 and 250 ng/ml LLO (Fig. 5⇓A, lanes 5 and 6). We also saw the neutralizing effect of Z-VAD-FMK on the process (Fig. 5⇓B, lane 7). Therefore, DNA laddering induced by LLO treatment follows the same dosage requirements as caspase-3 activation and PS exposure and is caspase-dependent. We also detected laddering in both day 8 and day 12 T cells treated with LLO, although at lower levels (unpublished observations). DNA laddering and activation of caspase of bulk T cell lines treated with LLO. A, Day 4 postantigenic stimulation T cells were treated with LLO for 24 h, and DNA was isolated, resolved on 1.5% agarose gels in Tris-acetate-EDTA, and visualized with ethidium bromide. Lane 1, 1-kb DNA ladder; lane 2, 100-bp DNA ladder; lane 3, untreated T cells; lane 4, 2.5 ng/ml LLO; lane 5, 25 ng/ml LLO; lane 6, 250 ng/ml LLO; lane 7, 250 ng/ml LLO and 100 μM Z-VAD; lane 8, irradiated T cells. B, Day 4 postantigenic stimulation T cells were treated with 250 ng/ml LLO, and cell lysates were taken for immunoblots at the indicated times post-treatment (U, untreated cells). Results are representative of at least two independent experiments. Treatment with the pan-caspase inhibitor Z-VAD-FMK blocked caspase-3 activation (Fig. 2⇑) and DNA laddering (Fig. 5⇑A) induced by LLO, but did not significantly reduce the number of cells positive for annexin V (Fig. 4⇑) or for mitochondrial depolarization (our unpublished observations). These data support the conclusion that activation of caspases and DNA fragmentation in LLO-treated lymphocytes was dependent on an upstream caspase(s), whereas the exposure of PS and the loss of ψm were not. We are currently investigating the role of each pathway in the death of LLO-treated T cells. The rate of apoptosis for T cells exposed to LLO was independent of the cell cycle state of the lymphocytes. Day 8 T cells treated with LLO activated caspase-3 and exposed PS with the same kinetics as day 4 T cells, reaching maximal cell numbers at the same time (our unpublished observations and Fig. 2⇑B). Our conclusion was that there was an activation level or state that was present in lymphocytes that sensitized them to LLO-induced apoptosis, but that once this condition was met, lymphocytes died at the same rapid rate. To verify that LLO was sufficient to induce apoptosis in vivo, we injected ∼40 nmol of LLO into the footpads of C.B-17 mice. Lymph nodes were removed after 24 h and stained with H&E (Fig. 6⇓, B and D) or by TUNEL (Fig. 6⇓, A and C). The popliteal lymph node pathology showed disruption of the peripheral and paracortical architecture without involvement of the medulla (Fig. 6⇓B). Foci of apoptotic lymphocytes were clearly visualized by TUNEL analysis (Fig. 6⇓, A and C). TUNEL positivity was most evident in the peripheral cortex and, to a lesser degree, the paracortex. The inguinal lymph nodes of mice that received LLO in their footpad showed no pathology (our unpublished observations). Therefore, LLO alone was sufficient to induce the in vivo apoptotic lesion observed during infection with the whole Listeria (3). Histology of lymph nodes treated with LLO. Mice were injected in the hind footpad with either pyrogen-free saline (D) or LLO (A–C). Nodes were isolated, fixed, and stained with H&E (B) or by TUNEL (A, C, and D). The box in A is magnified in C. Magnification: A and B, ×40; C and D, ×100. Pictures are representative of six mice from two independent experiments. 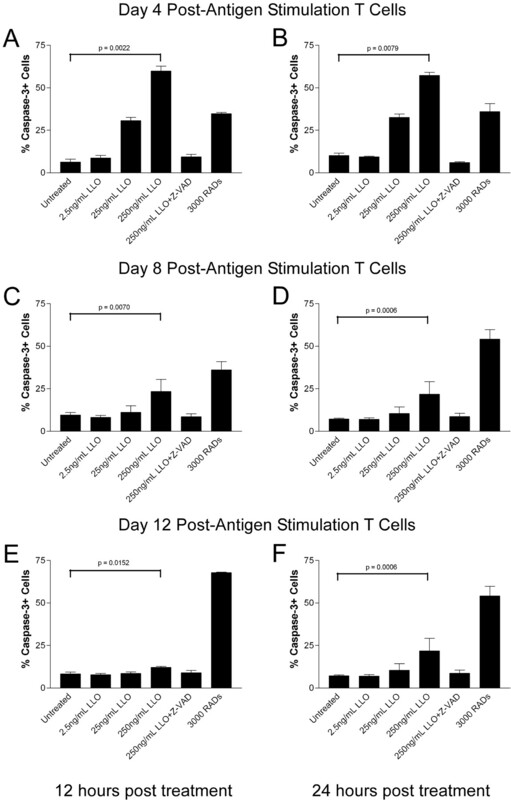 This report demonstrates that LLO induced T cell apoptosis with very rapid kinetics. LLO-induced apoptosis proceeded through caspase-dependent and caspase-independent cellular pathways. The rate of induction of apoptosis by LLO was very rapid, as assessed by caspase-3 activation, PS exposure, and loss of ψm. T cells were differentially sensitive to LLO; the dividing cells were very sensitive compared with resting cells. We verified our in vitro finding by showing that lymph node lymphocytes in a mouse also underwent programmed cell death in response to LLO injection. Listeria has evolved a pore-forming molecule whose principal role is to let it escape from the phagosome and gain entry into the nutrient-rich environment of the cytoplasm. However, LLO has emerged as a multifaceted virulence factor: it caused generation of a cytokine response independent of its pore-forming function (18), allowed calcium to flux into cells (19, 20), and, subsequent to calcium signaling, promoted endocytosis of Listeria into epithelial cells lines (20) and caused apoptosis in dendritic cells (12). In this study we reported a fifth function for LLO: induction of lymphocyte apoptosis, which is strongly supported by in vivo observation (3, 7). The mechanisms involved in the rapid induction of apoptosis are now under study. The rapidity with which LLO can kill dividing lymphocytes suggests that it is a membrane-proximal event. To our knowledge, the only previously described stimulus for the induction of apoptosis with such rapid kinetics is granzyme-mediated killing of CTL-targeted cells (21, 22). Calcium signaling, another membrane-proximal event, has been implicated in apoptosis downstream of bacterial virulence factors, including pneumolysin (8). LLO can induce calcium fluxes in at least two cell lines, so it is possible it does the same in lymphocytes. Another possibility is that LLO could disrupt organelles such as the mitochondrion, endoplasmic reticulum, or lysosome. The release of the mitochondrial factors, apaf-1 and cytochrome c, could lead to caspase-9-dependent apoptosis, a mechanism claimed to be involved in apoptosis downstream of the leukotoxin from A. actinomycetemcomitans (14). There is no precedent for a bacterial pore-forming molecule inducing apoptosis through the endoplasmic reticulum or lysosome, although there is an emerging body of work describing apoptosis after perturbation of either compartment (21). The late endosome and early lysosomal compartments are where LLO is normally used by Listeria. An intriguing possibility is that LLO causes the release of lysosomal proteases that lead to rapid lymphocyte death. Listeria is the only pathogen that causes profound splenocyte apoptosis during the early phase of infection. We hypothesize that Listeria traffic into the spleen of infected animals inside macrophages and escape the infected macrophage via the actions of LLO, among other proteins. We have seen extracellular Listeria near dying splenic lymphocytes by electron microscopy (3). Based on our new evidence, we suspect that extracellular Listeria releases LLO, which creates local microenvironments of high concentration within the spleen, leading to lymphocyte death. LLO may thus be promoting the growth of the bacteria by killing the main effector cell of the adaptive immune response against the Listeria, as well as killing macrophages by necrosis and dendritic cells by apoptosis (12). Although the activated lymphocyte is very sensitive to the actions of LLO, the resting lymphocyte is not. The peak of apoptosis induced after murine infection with Listeria occurred within the first 48 h, a time at which the adaptive immune response has not been fully activated, and the lymphocyte population is not dividing. We are currently trying to resolve this discrepancy. One possibility is that early proinflammatory signals, such as IFN-α, could trigger physiological changes that do not lead to cell cycle progression, but that sensitize lymphocytes to the actions of LLO (23). It has been reported that there is early Ag-independent activation of CD8+ lymphocytes during Listeria infection (24). Ag-nonspecific lymphocytes up-regulated CD69 by day 1 postinfection, but did not up-regulate late activation markers. The T cell line reported in our work was a CD4-restricted T cell line, whereas in vivo, CD8 cells may be the population that is more sensitive, due to the presence of a large amount of preformed lytic granules. Another possibility is that naive resting/partially activated lymphocytes are more sensitive to induction of apoptosis than a line that has been continually passaged in culture. In summary, we have demonstrated that LLO is sufficient to induce rapid apoptosis of lymphocytes, both in vitro and in vivo. This is the first thorough report of lymphocyte apoptosis induced by a purified bacterial pore-forming molecule, as we include all the major parameters for measurement of apoptotic processes. We suspect that LLO-induced lymphocyte apoptosis may have profound consequences for Listeria pathogenesis, as apoptotic lymphocytes are known to release factors that affect the immune response (25). These implications clearly merit further investigation. We thank the members of the Unanue laboratory, in particular Craig A. Byersdorfer, Richard J. DiPaolo, Brian T. Edelson, Scott B. Lovitch, and Anish Suri for their many helpful discussions; Kathy Fredericks for her animal husbandry; and Shirley Petzold for her technical advice. ↵1 This work was supported by grants from the National Institutes of Health. ↵3 Abbreviations used in this paper: LLO, listeriolysin O; 7-AAD, 7-amino actinomycin D; HEL, hen egg-white lysosyme; PS, phosphatidylserine; ψm, mitochondrial membrane potential; Z-VAD-FMK, Z-benzyloxy carbonyl-valyl-alanyl-aspartyl-fluoromethylketone. Unanue, E. R.. 1997. Studies in listeriosis show the strong symbiosis between the innate cellular system and the T-cell response. Immunol. Rev. 158:11. Merrick, J. C., B. T. Edelson, V. Bhardwaj, P. E. Swanson, E. R. Unanue. 1997. Lymphocyte apoptosis during early phase of Listeria infection in mice. Am. J. Pathol. 151:785. Rogers, H. W., M. P. Callery, B. Deck, E. R. Unanue. 1996. Listeria monocytogenes induces apoptosis of infected hepatocytes. J. Immunol. 156:679. Schluter, D., E. Domann, C. Buck, T. Hain, H. Hof, T. Chakraborty, M. Deckert-Schluter. 1998. Phosphatidylcholine-specific phospholipase C from Listeria monocytogenes is an important virulence factor in murine cerebral listeriosis. Infect. Immun. 66:5930. Edelson, B. T., E. R. Unanue. 2000. Immunity to Listeria infection. Curr. Opin. Immunol. 12:425. Edelson, B. T., P. Cossart, E. R. Unanue. 1999. Cutting edge: paradigm revisited: antibody provides resistance to Listeria infection. J. Immunol. 163:4087. Braun, J. S., J. E. Sublett, D. Freyer, T. J. Mitchell, J. L. Cleveland, E. I. Tuomanen, J. R. Weber. 2002. Pneumococcal pneumolysin and H2O2 mediate brain cell apoptosis during meningitis. J. Clin. Invest. 109:19. Palmer, M.. 2001. The family of thiol-activated, cholesterol-binding cytolysins. Toxicon 39:1681. Gaillard, J. L., P. Berche, J. Mounier, S. Richard, P. Sansonetti. 1987. In vitro model of penetration and intracellular growth of Listeria monocytogenes in the human enterocyte-like cell line Caco-2. Infect. Immun. 55:2822. Bielecki, J., P. Youngman, P. Connelly, D. A. Portnoy. 1990. Bacillus subtilis expressing a haemolysin gene from Listeria monocytogenes can grow in mammalian cells. Nature 345:175. Guzman, C. A., E. Domann, M. Rohde, D. Bruder, A. Darji, S. Weiss, J. Wehland, T. Chakraborty, K. N. Timmis. 1996. Apoptosis of mouse dendritic cells is triggered by listeriolysin, the major virulence determinant of Listeria monocytogenes. Mol. Microbiol. 20:119. Jonas, D., B. Schultheis, C. Klas, P. H. Krammer, S. Bhakdi. 1993. Cytocidal effects of Escherichia coli hemolysin on human T lymphocytes. Infect. Immun. 61:1715. Korostoff, J., N. Yamaguchi, M. Miller, I. Kieba, E. T. Lally. 2000. Perturbation of mitochondrial structure and function plays a central role in Actinobacillus actinomycetemcomitans leukotoxin-induced apoptosis. Microb. Pathog. 29:267. Korostoff, J., J. F. Wang, I. Kieba, M. Miller, B. J. Shenker, E. T. Lally. 1998. Actinobacillus actinomycetemcomitans leukotoxin induces apoptosis in HL-60 cells. Infect. Immun. 66:4474. Stevens, P. K., C. J. Czuprynski. 1996. Pasteurella haemolytica leukotoxin induces bovine leukocytes to undergo morphologic changes consistent with apoptosis in vitro. Infect. Immun. 64:2687. Gedde, M. M., D. E. Higgins, L. G. Tilney, D. A. Portnoy. 2000. Role of listeriolysin O in cell-to-cell spread of Listeria monocytogenes. Infect. Immun. 68:999. Kohda, C., I. Kawamura, H. Baba, T. Nomura, Y. Ito, T. Kimoto, I. Watanabe, M. Mitsuyama. 2002. Dissociated linkage of cytokine-inducing activity and cytotoxicity to different domains of listeriolysin O from Listeria monocytogenes. Infect. Immun. 70:1334. Repp, H., Z. Pamukci, A. Koschinski, E. Domann, A. Darji, J. Birringer, D. Brockmeier, T. Chakraborty, F. Dreyer. 2002. Listeriolysin of Listeria monocytogenes forms Ca2+-permeable pores leading to intracellular Ca2+ oscillations. Cell. Microbiol. 4:483. Dramsi, S., P. Cossart. 2003. Listeriolysin O-mediated calcium influx potentiates entry of Listeria monocytogenes into the human Hep-2 epithelial cell line. Infect. Immun. 71:3614. Jaattela, M., J. Tschopp. 2003. Caspase-independent cell death in T lymphocytes. Nat. Immunol. 4:416. Froelich, C. J., K. Orth, J. Tubov, P. Seth, R. Gottleib, B. Babior, G. M. Shah, R. C. Bleackley, V. M. Dixit, W. Hanna. 1996. New paradigm for lymphocyte granule-mediated cytotoxicity. J. Biol. Chem. 271:29073. Sun, S., X. Zhang, D. F. Tough, J. Sprent. 1998. Type I interferon-mediated stimulation of T cells by CpG DNA. J. Exp. Med. 188:2335. Jiang, J., L. L Lau, H. Shen. 2003. Selective depletion of nonspecific T cells during the early stage of immune responses to infection. J. Immunol. 171:4352. Chen, W, M. E. Frank, W. Jin, S. M. Wahl. 2001. TGF-β released by apoptotic T cells contributes to an immunosuppressive milieu. Immunity 14:715.